As we grow wiser with our eating habits, we might start to resist the cravings for burgers & fries and look for healthier alternatives. Deli sandwiches have become a popular option, and there are some seriously tasty choices available. There are days, however, when maybe you skimped on breakfast and you feel that you could eat the kitchen sink. Well, you can. The Kitchen Sink is a sandwich—and oh, what a sandwich—at Leger’s Deli. 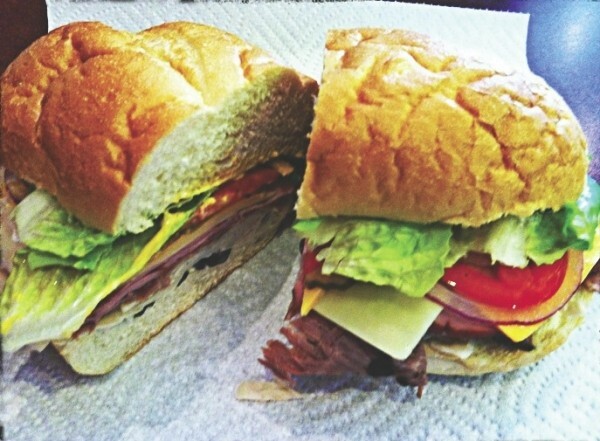 The skinny list of ingredients includes roast beef, turkey, ham, provolone, cheddar, American, Swiss, tomato, pickles, red onion, lettuce, sprouts, olives, mayo, mustard, oil and vinegar on a roll. When you get a “full” for $9.97, it’s about the size of a football. Leger’s was built on this concept 26 years ago: “Build the best sandwiches, using the finest ingredients, for a fair price.” Ordering the kitchen sink, with its extensive list of nearly everything in the store, caused me to wonder whether it’s just filled with sub-par ingredients, with size being the only attraction. But, taking my first bite proved that “fresh” and “quality” are two words that Leger’s lives by. The ingredients that stood out were the roast beef and ham. Both were moist, packed with the kind of flavor you get at an expensive deli—the kind where your mouth waters as you watch them slice the meat and cheese. The only average item was the roll. It’s easy to overlook this one thing when everything else is great, but higher quality bread would only boost the “wow” factor. Leger’s has three locations throughout the valley, in North Salt Lake, South Salt Lake and West Jordan. The deli’s self-proclaimed “valley’s best sandwich” is up to each of us to confirm, but a visit is likely to have you agreeing.